Who: My husband is wearing our then 13 month old daughter. Our older daughter (age 5) and I were also there, along with my sister-in-law and our two nieces, ages 3 and 6. Where: We were in Napa, CA for Spring Break and took a day trip to Pacifica Beach. It was the baby’s first trip out west and her first dip in the Pacific Ocean. 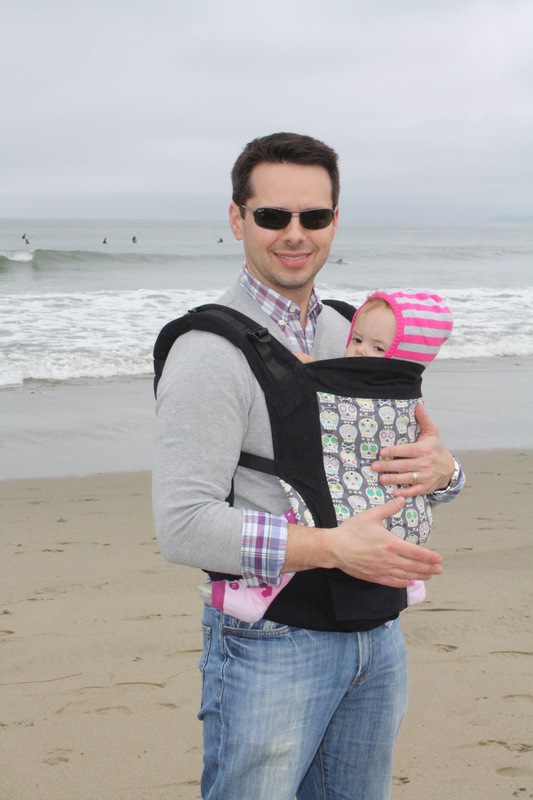 What: My husband is wearing our baby in a standard size canvas Tula baby carrier. Even though it was on the chilly side for a day at the beach (as it usually is near San Francisco), the older girls had a great time playing in the sand. Baby stayed warm and cozy snuggled with Daddy while watching the big girls play. We took her out briefly for a quick dip of her toes in the Pacific and she went right back in with Mama to nurse. We used the Tula every day on our trip, and it was a life saver for getting through the airport. Why: Babywearing is a huge part of our everyday lives. On this particular occasion, it was chilly so baby needed to be warm and protected from the winds. This also allowed her to see everything around her, including her sister and cousins playing and the cool surfers riding the waves. Wearing her also kept her out of the sand, an added bonus for a mama who doesn’t want sand in everyone’s hair!